It’s no secret at this point that I like KontrolFreek’s performance thumbsticks. After years of using various different KontrolFreek models on every controller I own, I absolutely cannot game without them anymore (trust me, I tried the other day and it just felt awful). While they may seem like a small and unnecessary accessory, you don’t know what your missing until you’ve clipped a couple onto your DualShock 4 and spent the day with them. Even if you aren’t looking to increase your performance in a high-stress first-person shooter, the comfort they add while playing any other game is worth adding a couple of low or mid-rise sticks to your arsenal. So yes, I am back again looking at the newest set of KontrolFreek performance thumbsticks, and if this ends up being longer than some of my game reviews, just know that I played every one of those review games with KontrolFreeks on my thumbsticks. One of the minor issues I’ve had with my excessive use of the thumbsticks is that they eventually wear down. Now, keep in mind I’m playing a lot more than most people—we’re talking about years of use for hours a day—but I’ve got some original Destiny-branded thumbsticks from a few years back that are starting to look and feel a little aged (though have admittedly held up quite well over the years). When KontrolFreek reached out and offered to let me check out the Rush thumbsticks, with a new material and new design, I was more than eager to see what they had in store for me. When I got them, I was happy to see a mid-rise thumbstick, my preferred height for most applications. The new material feels really good, and while I can’t do years’ worth of testing in the span of a week or so, they feel like they’ll hold up under extensive use. It’s a softer variation on their proprietary materials, and that malleability gives it a certain durability (kind of like the science behind the harder a metal is, the more brittle and prone to breaking it is). I’m eager to see how they hold up long term, but my first impressions are good. Sporting a whole new shape, the KontrolFreek Rush performance thumbsticks are a convex bowl with pronounced lip around the edge to really hold your thumbs in place and provide the ultimate control. 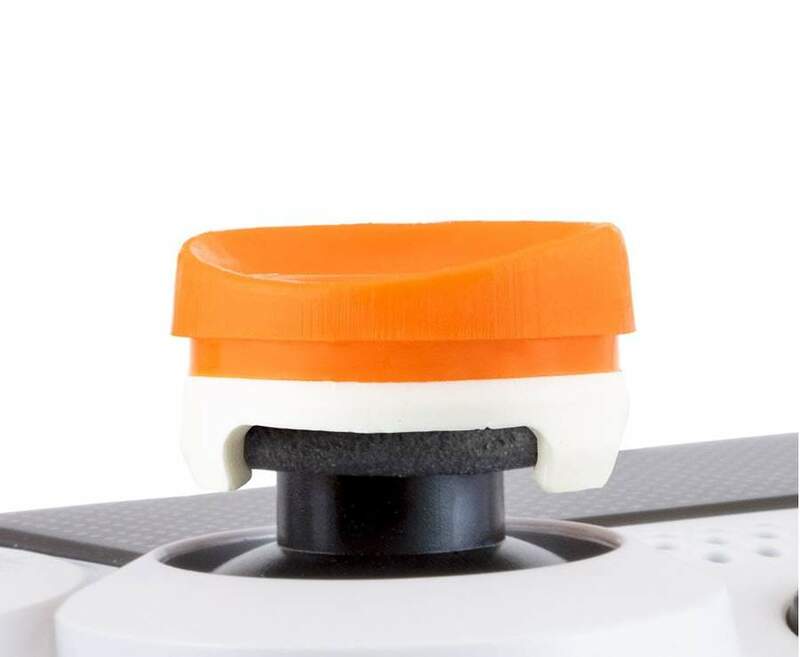 One part of this raised lip has an opening that allows you to adjust the rotation of the thumbstick to exactly where your thumb lies. At first, I had a lot of problems adjusting to these sticks. I typically rest my thumbs across my thumbsticks with the tips sticking out over one side, and these ones very much promote using the ends of your thumbs centered right on top of the thumbstick. Once I adjusted my hand positioning, the Rush thumbsticks felt great. The held the tips of my thumbs in place and gave me a lot of precise control over every movement the thumbsticks made. Ideally, the Rush thumbsticks are best for people with smaller hands, those who play using the claw configuration, and those who have extra paddles on their controllers (like the Scuf or Evil Controllers that require a different kind of grip to hold and use). I noticed that my wife plays with the ends of her thumbs as opposed to resting them along the controller like I normally do, and had her try the Rush thumbsticks. Judging by her reaction, I don’t think I’m ever getting them back. They’ve helped her incredibly in the obscene amounts of Overwatch that she plays. Unfortunately the Rush thumbsticks have one caveat, and it’s like the old Ford slogan. You can get them in any color you want… as long as it’s orange. If you’re not a big fan of orange (like myself), then you’ll have to either deal with it or get something else. Obviously KontrolFreek knows that looks are important. After all, they released the super popular purple Battle Royale thumbsticks in an all-black Nightfall edition for those that didn’t want bright purple on their controllers. Hopefully we see more designs get a few color options to support the varying visual styles that people like on their DualShock 4s. 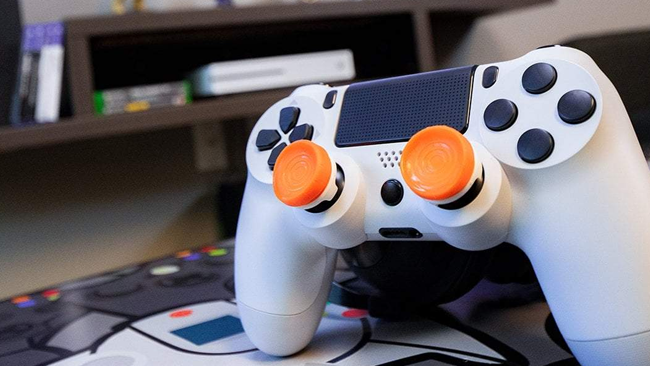 The KontrolFreek Rush performance thumbsticks are great if you play with your thumbs centered on the sticks (or are willing to alter how you play) and you like the color orange. The new material feels durable without sacrificing comfort or grip. They are some of the most comfortable and uniquely designed thumbsticks that KontrolFreek has. While they may not be entering my regular rotation because of the way my thumbs lie, my wife was more than happy to take them out from under my thumbs and add them as tools to her arsenal. Even if these ones aren’t for you, KontrolFreek’s got a whole lineup of colors, styles, and heights to choose from, so everyone can get enhanced performance that looks and feels right for them. KontrolFreek Rush Performance Thumbsticks were provided by KontrolFreek for review. For more information, please read our review policy.